As you journey across Europe in style, unique dining experiences abound. Local, seasonal produce stars as we take fresh ingredients on board at stops along the route. Glance through the window and you may spot Executive Chef Christian Bodiguel and his skilled team inspecting lobsters from Brittany or salt marsh lamb from Mont St Michel. 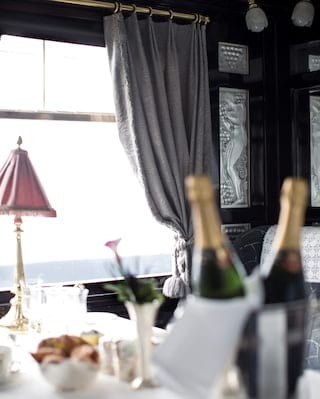 Be enticed by the flavours of Europe aboard the Venice Simplon-Orient-Express. Set menus that celebrate exceptional artisanal cuisine are an inclusive part of your trip. Drinks and à la carte options are also available at an additional charge. Don’t forget to inform us of dietary requirements in advance for a culinary journey that’s tailored to you. Indulge in a special breakfast prepared by Executive Chef Christian Bodiguel. 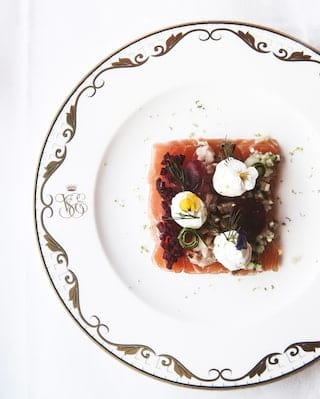 A tempting selection of fresh breads, smoked salmon, eggs, truffles and caviar make a magical morning feast. Available on all southbound journeys and can be booked onboard. ‘Côte d’Azur’, with its stunning René Lalique glass, was built in 1929 as a first-class Pullman. It began in the Côte d’Azur Pullman Express before switching to the Deauville, running for winter journeys from Paris to Calais for many years. By 1961 it was in a reserve pool. Eventually stored at the Wagons-Lits works at Villeneuve, it was rescued from a cold and dreary siding in 1981 by Venice Simplon-Orient-Express. ‘Etoile du Nord’ was built in 1926 in England, and showcases some of the most beautiful marquetry in the continental rake. It ran with the Etoile du Nord train from Paris and then switched to the Edelweiss based in Amsterdam. After running with the Lusitania Express from Lisbon to Madrid it finished service in the 1970s, travelling between Cadiz and Seville. ‘L'Oriental’ was originally a Pullman kitchen car. Built in Birmingham in 1927 in the Etoile du Nord style, it ran a luxurious service between Paris and Amsterdam. It later joined the Lusitania Express. As you anticipate the arrival of a delicious lunch or dinner, relax in surroundings rich with craftsmanship and steeped in history. Deep green velvet armchairs, crisp white tablecloths and exquisite marquetry: the romance of a bygone era is perfectly captured by ‘Etoile du Nord’. With its bewitching mix of black lacquered wall panels and sumptuous fabrics, 'L’Oriental’ spirits you to the exotic East. 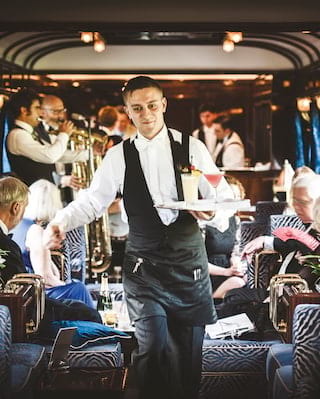 Escape into a world of timeless glamour in our iconic bar car, where beautiful blue and gold interiors set the scene for an elegant evening with friends. Sample the finest champagnes in our exclusive bar. Art deco interiors and Lalique glassware conjure the romance and glamour of the Roaring Twenties. Vintages include Taittinger, Laurent Perrier Rosé and Louis Roederer Cristal—perfectly chilled. Please contact us directly to discuss your requirements and we will be delighted to help. Ideal for special occasions a private charter gives you the ultimate flexibility. If you’re looking for wow factor, the Venice Simplon-Orient-Express train is unrivalled.